Dr Shaveta Gupta is a Consultant in the Department of Obstetrics and Gynaecology at MAx Super Speciality Hospital, Mohali. She has done her M.B.B.S from Govt. Medical College, Nagpur and DNB in Obstetrics & Gyanecology from Maharaja Agrasen Hospital, Punjabi Bagh, New Delhi. She has experience of Senior Residency in some of the most reputed Hospitals such as Max hospital Pitampura & Gurgaon, DDU Hospital Hari Nagar and Medanta - The Medicity Gurgaon; during this tenure she has had done nearly 300 Caesarean Sections and 500 D&C procedures independently. The chief area of interest of Dr Shaveta is in gynaecological oncology. She also have completed observership in Gynae-Oncology at Tata Memorial Hospital, Mumbai and Ultrasound training in Obstetrics and Gynecology and abdomen. Dr Shaveta is well versed in doing procedures like D & C, MTPs, normal deliveries, Caesarean sections, Hysterectomies (vaginal, abdominal, laparoscopic assisted vaginal hysterectomy, ovarian cystectomy, hysteroscopy, hystero-salpingography, MacDonald’s stitch, Manchester procedure, cervical biopsy, myomectomy, cryocautery, vaginoplasty and tuboplasty. 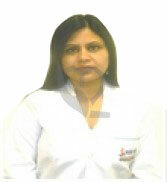 Dr Shaveta has extensive experience in diagnosing and treating cases of infertility, menorrhagia, PID, endometriosis, STDs, fibroids, and gynaecological malignancies, and have also gained adequate experience in preconceptional counselling, contraception counselling and post-menopausal problem management.